Information courtesy B-G Andersson and David Knauth, JHU. Presentation courtesy of Lisa De Nike and William Blair, JHU. Using NASA's Far Ultraviolet Spectroscopic Explorer (FUSE) satellite, researchers have for the first time detected molecular nitrogen in interstellar space, giving them their first detailed look into how the universe's fifth most-abundant element behaves in an environment outside the Solar System. This discovery, made by astronomers at The Johns Hopkins University, Baltimore, promises to enhance understanding not only of the dense regions between the stars, but also of the very origins of life on Earth. "Detecting molecular nitrogen is vital for improved understanding of interstellar chemistry," said David Knauth, a post-doctoral fellow at Johns Hopkins and first author of a paper in the June 10 issue of Nature. "And because stars and planets form from the interstellar medium, this discovery will lead to an improved understanding of their formation, as well." Nitrogen is the most prevalent element of Earth's atmosphere. Its molecular form, known as N2, consists of two combined nitrogen atoms. A team of researchers led by Knauth and physics and astronomy research scientist and co-author B-G Andersson continued investigations of N2 that began in the 1970s with the Copernicus satellite. At least 10,000 times more sensitive than Copernicus, FUSE - a satellite-telescope designed at and operated by Johns Hopkins for NASA - allowed the astronomers to probe the dense interstellar clouds where molecular nitrogen was expected to be a dominant player. "Astronomers have been searching for molecular nitrogen in interstellar clouds for decades," said Dr. George Sonneborn, FUSE Project Scientist at NASA Goddard Space Flight Center, Greenbelt, Md. "Its discovery by FUSE will greatly improve our knowledge of molecular chemistry in space." The astronomers faced several challenges along the way, including the fact that they were peering through dusty, dense interstellar clouds which blocked a substantial amount of the star's light. In addition, the researchers confronted a classic Catch-22: Only the brightest stars emitted enough of a signal to allow FUSE to detect molecular nitrogen's presence, but many of those stars were so bright they threatened to damage the satellite's exquisitely-sensitive detectors. 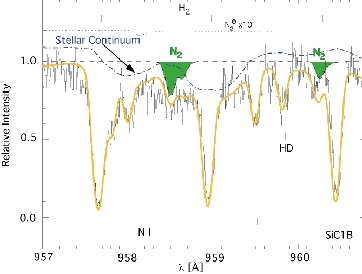 HD 124314, a moderately-reddened star in the southern constellation of Centaurus, ended up being the first sight line where researchers could verify molecular nitrogen's presence. 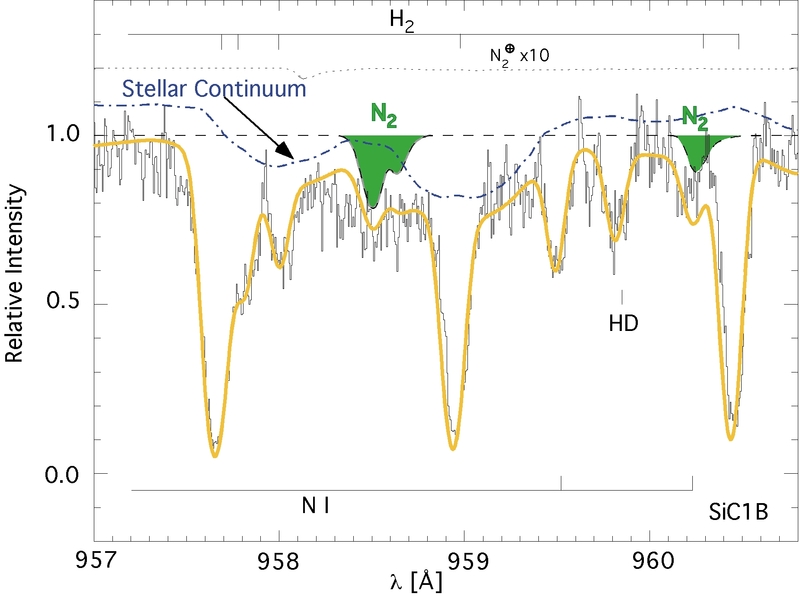 This discovery is an important step in ascertaining the complicated process of how much molecular nitrogen exists in the interstellar medium and how its presence varies in different environments. "For nitrogen, most models say that a major part of the element should be in the form of N2, but as we had not been able to measure this molecule, it's been very hard to test whether those models and theories are right or not. The big deal here is that now we have a way to test and constrain those models," Andersson said. Photo credits: (top) Adam Block and NOAO. (See Astronomy Picture of the Day for June 2, 2004 for more information.) (bottom) courtesy of B-G. Andersson, JHU. The JHU news release about this observation can be found HERE.